Yeah, I looked and discovered the exact cause of the bug, which is fixed with the patch I just put down. On one hand it's definitely a shame you lost your party, but it is good for the fact that I've discovered and fixed the bug. I noticed a massive frame-rate drop as I was heading towards the pokemon center. This went away later in the game, so I am guessing this was before some scripted events took place? If you are ever concerned about optimizing that would be a spot to look at. I am not sure what caused it though. I found three bugs during my playthrough of the game, here's an imgur album of them. The first bug is a problem with the engine rather than this, it'll happen in any Pokemon Essentials fangame. The second was an oversight. Oops. The third isn't shiny. That's a gender variant. The shiny marker appears for the real shiny. I may have found another small bug / oversight, Majemag is missing a back sprite both in battle and in the pokedex as seen below. I'm just assuming this is a bug, for all I know it's not supposed to have a back sprite. Can we get a list of evolution methods for fakemon? I'm training up a Makupika, but it still hasn't evolved or learned a fighting-type move by lvl 31 (Caught it at lvl 20). So just after I asked this...Bro/Hate also has a Makupika in its 80s. Is it even able to evolve? Makupika is the stronger Pokemon between the two - it doesn't evolve. Don't know why it takes so long to get a fighting move, though. yeah, i noticed that Makupika takes a long time to get a Fighting move, at least it's worth it cause it's Close Combat, which to me is the best Fighting move hands down. also, was the whole Makupika thing kind of a throwback to the anime in which Pikachu beats Surge's Raichu because of it's speed? This Pokémon was planned as dlc later so it was rushed into the game last minute. It currently only has a front and party sprite since it was not planned to be capturable yet. It'll be fixed eventually. ah i see, so it was released as an endgame catchable at kind of the last minute? well that would explain the missing back sprite. good to know as if i had gone to catch it and was missing a sprite i'd think something was wrong too. Hey there. I've been playing for the past few days. I like this game a lot. But I ended up running into a bug that could very well prevent me from finishing the game. Here's what happened. A few days ago I fought the Magizard at ColdSteel and lost. but then after that the game let me move the screen. and then the game let me fight Magizard again with all my Pokemon at full health. When I beat him I noticed there was a second Fang standing there. I figured it wasn't a big deal so I closed the game for the night. The next time I opened it I went into the gym and the second Fang was standing in front of Asshat. This Fang is an obstacle that I can't get past and I can't talk to Asshat. After seeing Vinny play this I knew I had to experience it for myself. However, a fatal error happened to me. When I beat the first gym leader and the cutscene was going to start, the game froze and crashed. 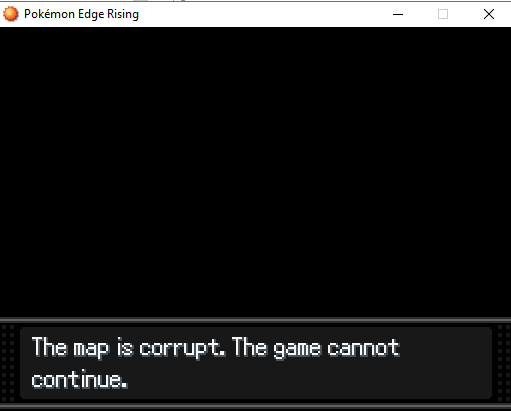 It saved before crashing, but now whenever I try to load my save, it says "This map is corrupt, the game cannot continue." My party was a level 11 Bidoof (DERPS), a level 14-ish Rattastic (Mindbreak), a level 12 Squirro (Brat), a level 13 blade monkey thing I forgot the name of (Thugga), a level 12-ish Mankey (Violator) and a level 14 Staravia (Raptor). 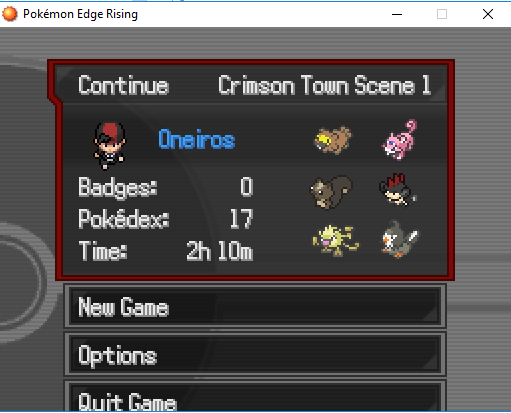 kind of just the MC being an edgelord and "killing all the big Pokemon"
the morality when it came to killing trainers not really amounting to anything, but maybe that's just Undertale spoiling me / me overthinking an edgy Pokemon fangame. Overall, this game really was fun while it lasted. I can't tell if the DLC teasers are a joke or not, but I kinda hope they aren't because I would totally play something like this again. The second Magizard bug was something that occurred in an older version. Did you update? I feel like that may have had something to do with it. Please state the problem so we know what the issue is.